The U.S. Senate passed a comprehensive immigration reform bill in 2013, but there has been little legislative action since or presidential executive action on immigration reform. A solid majority (66%) of Hispanic voters believe passing new immigration legislation soon is extremely important or very important according to the new survey. This is up six percentage points from 2013, when 60% of Latino registered voters said it was extremely important or very important to pass significant new immigration legislation in 2013 (Lopez et al., 2013). Among Latino registered voters, the foreign born are more likely than the U.S. born to say that passing significant new immigration legislation sometime soon is extremely or very important, by a margin of 77% to 61%. Similarly, Spanish-dominant Latinos (76%) and bilingual Latinos (71%) are more likely than the English dominant (55%) to say passing immigration reform soon is extremely or very important. When asked who they considered responsible for the delay in passing immigration legislation, 45% of Hispanic voters say Republicans in Congress. But Democrats share some of the blame, according to the survey. Among Hispanic registered voters, 34% say either President Obama (20%) or Democrats in Congress (14%) are to blame for the stalled legislation. There are partisan differences in the way Latino registered voters assign blame for the lack of progress on new immigration legislation. Latino Democrats are more than three times as likely as Latino Republicans (by a margin of 62% to 19%) to say Republicans in Congress are mainly responsible for not passing significant new immigration legislation. By contrast, a majority (55%) of Latino Republicans say the main responsibility lies with President Obama (36%), Democrats in Congress (19%), or both (1%). Differences on who Latino registered voters blame for the lack of progress on immigration reform also varies according to educational attainment levels. About half (51%) of Latino registered voters with at least some college education blame Republicans in Congress for not passing new immigration legislation, while 30% blame Obama (18%) or the Democrats in Congress (11%). By contrast, about a third (35%) of Latino registered voters with less than a high school diploma blame Republicans in Congress, while close to half (46%) blame Obama (32%) or Democrats in Congress (15%). Among all Latino adults, Democrats in Congress and President Obama (40%) are as likely to be blamed for the stalled immigration legislation as Republicans in Congress (40%). No significant differences are found between U.S. born and foreign born Latinos on this question. Most Latino registered voters say they have heard about President Obama’s decision to delay until after the election any executive action that would extend deportation relief to more of the 11.3 million unauthorized immigrants who reside in the U.S. There are mixed feelings among Hispanic voters who have heard of the president’s decision to delay executive action on deportation relief. About a third of Hispanic voters (35%) say they are either disappointed (26%) or angry (9%) with President Obama’s decision, while about one-fourth (26%) say they are either very happy (7%) or pleased (19%). Spanish-dominant Latino voters are among the most likely to say they have heard about Obama’s decision to delay executive action on immigration, with 79% having heard at least a little about it. They are also among the most likely to say they are disappointed (30%) or angry (17%) about the decision. By contrast, 62% of English-dominant Latino voters and 69% of bilingual Latino voters say they have heard at least a little about the decision. And about a third of bilingual (34%) and English-dominant (31%) Latino voters express negative feelings about Obama’s decision. Foreign-born Hispanic registered voters are somewhat more likely to have heard about the president’s decision to delay executive action on immigration than their U.S.-born counterparts, by a margin of 72% to 66%. Among foreign-born Hispanic voters, 44% express anger (11%) or disappointment (33%) about the president’s decision, compared with two-in-ten immigrant Hispanic voters say they feel either pleased (13%) or very happy (8%). By contrast, among U.S.-born 31% are disappointed (23%) or angry (8%) with the decision and 28% are either pleased (22%) or very happy (6%) with it. Latino voters who identify with or lean toward the Republican Party express more negative than positive feelings about Obama’s decision, with one-quarter (27%) saying they feel disappointed and 15% saying they are angry about it, while 15% say they are either pleased (11%) or very happy (4%) with the decision. By contrast, feelings among Latino voters affiliated with the Democratic Party are split. Some 32% are either disappointed (25%) or angry (7%) with the decision, while 33% are either pleased (24%) or very happy (9%) with it. Latino voters who say they are “dissatisfied” with the direction of the country are also more likely to say they are upset about the delay in executive action, with 29% disappointed and 9% angry. Meanwhile 35% who are satisfied with the country’s direction are either pleased (24%) or very happy (11%) with the president’s decision. Among all Latino adults, immigrants who are neither U.S. citizens nor legal permanent residents are most likely to express negative feelings about Obama’s decision to delay action extend deportation relief to undocumented immigrants. About half (53%) of non-legal resident Latinos express negative feelings about Obama’s decision, with 46% saying they are disappointed with the announcement, while an additional 7% say they are angry. Similar shares of both legal resident Latinos (45%) and naturalized immigrant Latinos (44%) express negative feelings about Obama’s decision. 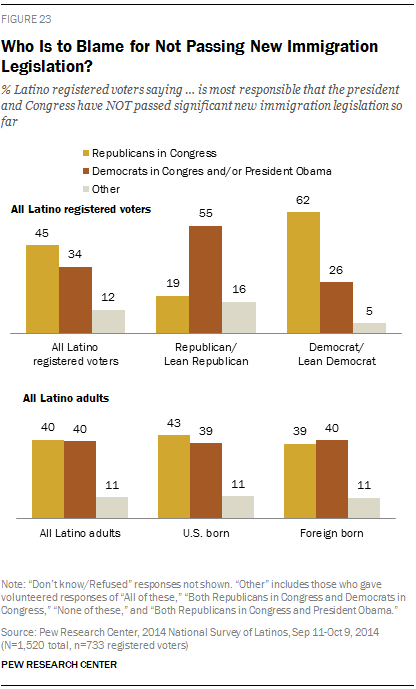 U.S.-born Latinos are less likely to be upset with Obama’s decision than immigrant Latinos. Some 22% of U.S.-born Latinos are disappointed and another 7% are angry. By contrast, 39% of immigrant Latinos say they are disappointed and 9% say they are angry. This summer, a spike in the number of Central American unaccompanied minors crossing the border captured the attention of the U.S. public (Krogstad and Gonzalez-Barrera, 2014). President Obama increased security and enforcement at the U.S.-Mexico border, and worked with Central American and Mexican governments to curb the flow of unaccompanied children to the U.S. (The White House, 2014). When asked about what the priority should be in dealing with illegal immigration in the U.S., 84% of Latino registered voters say that creating a pathway to citizenship for undocumented immigrants should either be the top priority (46%) or just as important as better border security (38%). Only 14% of Latino registered voters believe that better border security should be the priority. Latino voters ages 18-to-29 are most likely to prioritize a pathway to citizenship. Fully six-in-ten young Latino voters say this, while 10% say the priority should be better border security and enforcement. An additional 30% say both should be equally important. Foreign-born Latino voters are among the most likely of all groups to favor prioritizing both a pathway to citizenship and better border security. 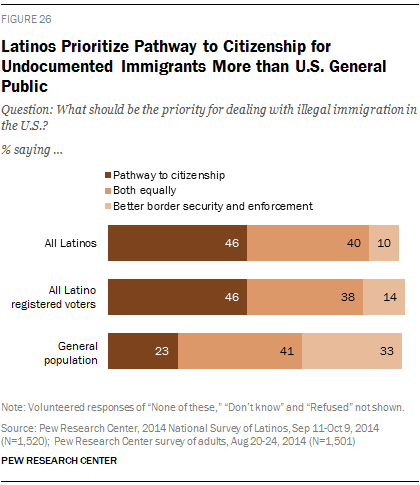 Close to half (47%) of immigrant Latino voters favor giving equal priority to both measures. Some 41% favor giving priority to a pathway to citizenship, while only 9% say border security should be the priority. Republican Latino voters are among the most likely to say better border security and enforcement should be the top priority in dealing with illegal immigration, with about one-quarter (23%) saying so. Among Democratic Latino voters, just 9% prioritize better border security and enforcement. Similar shares of Republican and Democratic Latino voters say a pathway to citizenship for undocumented immigrants should be the priority, with some 43% of Republicans and 48% of Democrats saying so. When it comes to their vote, half (54%) of Latino registered voters say they would vote for a candidate who disagrees with them on immigration policy if that candidate agrees with them on most other issues. But 36% of Latino registered voters say they would not vote for a candidate who disagrees with them on immigration policy. Among Hispanic registered voters, six-in-ten (62%) Republicans and half (52%) of Democrats say they could still vote for a candidate who disagrees with them on immigration. However, four-in-ten Democrats say they would not vote for a candidate if that candidate’s position on immigration differed from their own. Among Republicans, one-fourth (26%) say the same. Six-in-ten Latino registered voters with at least some college education say they would vote for a candidate who does not share their views on immigration but agrees with them on most other issues. By comparison, about four-in-ten (43%) with less than a high school diploma say the same. The survey also finds that six-in-ten (59%) English-dominant Latino registered voters say a candidate’s position on immigration policy is not a deal-breaker in deciding their vote, while only about three-in-ten (29%) say a candidate’s position on immigration policy would not decide their vote. By contrast, if a candidate’s position on immigration policy is different from their own, half (49%) of Spanish-dominant Latino voters say they would not vote for that candidate. Personal connection with the issue of deportations could cause immigration policy to be a deal-breaker issue. About half (46%) of Hispanic registered voters who say they personally know someone who has been deported or detained for immigration reasons in the last 12 months say they would not vote for a candidate who disagrees with them on immigration policy but agrees with them on most other issues. Meanwhile, only a third (33%) of those who do not personally know someone who has been detained or deported say immigration policy is a deal-breaker issue. The Pew Research Center survey asked Hispanic adults which is more important for undocumented immigrants currently living in the U.S.: Being able to live and work in the U.S. legally without the threat of being deported, or having a pathway to citizenship for those who meet certain requirements. A larger share of Hispanic adults (a margin of 56% to 35%) says it is more important that undocumented immigrants be able to live and work in the U.S. without the threat of deportation than say they should have a pathway to citizenship. Among Hispanic adults, immigrants (59%) are more likely than U.S. born Hispanics (54%) to say that being able to live and work legally is more important. These views are virtually unchanged from a year ago, when 55% of Latino adults said being able to live and work without the threat of deportation was more important, and 35% prioritized a pathway to citizenship (Lopez, et. al., 2013). Among Latino registered voters, 51% say deportation relief is more important than a pathway to citizenship for undocumented immigrations. Meanwhile, four-in-ten (40%) Latino voters say the opposite. As U.S. deportations reached a record high in fiscal year 2013 (Gonzalez-Barrera and Krogstad, 2014), one-in-four (26%) of all Latinos and 24% of Latino registered voters in the new survey say they personally know someone who has been deported or detained for immigration reasons in the last 12 months. Familiarity with detainment and deportation is highest among foreign-born Hispanics who are not U.S. citizens and not legal residents. Among this group, more than a third (36%) say they know someone who has been deported or detained in the past year. However, familiarity with deportation is not limited to the foreign born. One-quarter (23%) of U.S.-born Hispanics say they personally know someone who has been detained or deported in the last 12 months. This share rises to 31% among U.S.-born Hispanics who have at least one immigrant parent. Young Latinos ages 18 to 29 are twice as likely (by a margin of 34% to 17%) as Latinos ages 50 and older to say that they know someone who has been deported or detained for immigration reasons. Six-in-ten (63%) of all Latinos say they disapprove of the way the Obama administration is handling the deportation of unauthorized immigrants, while only one-in-four (25%) say they approve. Immigrant Latinos (72%) are more likely than U.S.-born Latinos (52%) to say they disapprove of deportation policy. By contrast, 20% of immigrant Latinos say they approve, compared with 33% of U.S.-born Latinos who say the same. Among Hispanic registered voters, about half (55%) say they disapprove of the Obama administration’s handling of deportations, while one-third (33%) say they approve. These results are similar to those in 2011, when 59% of Latinos said they disapproved of Obama’s handling of deportations, while 27% approved. About two-thirds (65%) of those who know someone who has been deported or detained in the last 12 months disapprove of the administration’s deportation policy according to the new survey. Among those who do not know someone who has been deported or detained, 52% say they disapprove.